Many runners I speak with seem to be unsure about the value of strength training for running. There is a common misconception that it can slow you down, as big bulky muscles are not desirable for running. This is definitely true for the upper body, but the topic needs further explanation wen you are referring to the lower body muscles. 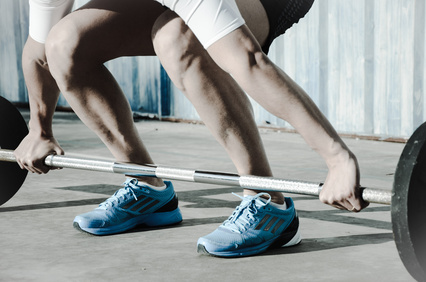 The truth is that muscle strength is a vital part of being able to run, and working on the strength of the muscles most involved in running will not only improve your speed, but also increase endurance and help you reduce your injury risk. Consider one research article published in the Journal of Applied Physiology in 2000(Weyand, P. et al) titled “Faster top running speeds are achieved with greater ground forces not more rapid leg movements”. They examined 33 subjects of varying ability, male and female, running at top speed on a level treadmill. The treadmill was equipped with a force plate which measured ground forces exerted by each runner.They also measured swing time, ie the time between foot strike on the same leg, which is ultimately a measure of stride frequency(how fast your legs turn over). They found that there was a range of top speeds, from 6.2- 11.1 m/s, but there was no significant difference in swing times between runners, ie their leg speed was very similar. There was however a significant difference in force per weight(Mass Specific Force) for each runner, with the faster runners applying a much greater MSF to the force plate. They concluded that faster running speeds were a product of greater MSF rather than increases in stride frequency. This resulted in a greater stride length. This comes down to basic physics where speed= distance/time. How do you cover more distance with each stride? You apply a greater force to the ground. How do you do that? You build the strength of the muscles that propel you forward, mainly the “posterior chain muscles” such as the glutes, hamstrings and calf muscles. If you can also reduce your ground contact time, ie the time your foot is in contact with the ground to exert this force, you can further improve your speed. Not only will you be running faster, but you will be running more efficiently, requiring less energy to run at a given pace. Strength training improves your running economy, and there are many research articles to support this… it has been proven scientifically! Strength and work rate/contractility(all interdependant) of the athlete’s skeletal muscles. These factors determine VO2max, ie the maximum rate ( by volume) of oxygen consumed by the body to fuel muscle activity, not vice versa according to Noakes. This is known as the Central Governor Model of exercise performance, and dictates that muscle strength will be a key factor in an athlete”s aerobic fitness. So if muscle strength is important for running, what’s the best way to train these muscles, which muscles are most important, and which muscles are important for preventing injury? How can you test which muscles in your own body are weak and need specific training? I have answered all of these questions in my ebook, and explored the concept of strength training in much more detail.